The Fulfillment - Klimt tapestry shows the work of Gustav Klimt, the artist of the Viennese Seccession movement and Art Nouveau. The couples are embracing here in this work also known as the Fulfilment. The couple's robes are in a geometric design, as is the radical background of the curving branches of the Tree of Life with flowers also in a geometric design. The work is a piece which is one of the most popular of Klimt's works. The Vienna Secession was formed by a group of artists who decided to form their own movement in a variety of styles, away from historicism and towards a new modern era of art. 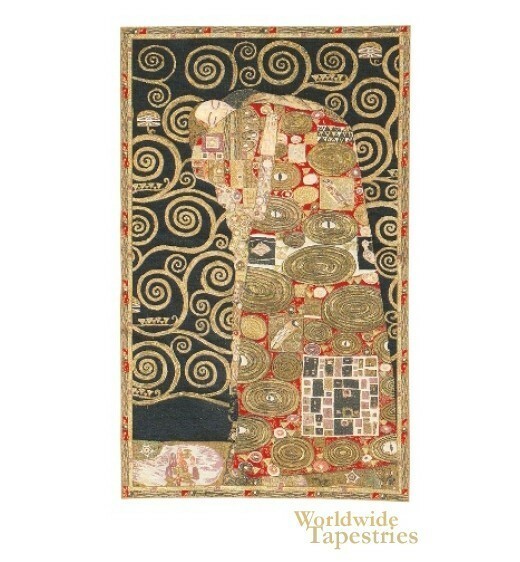 The Fulfillment - Klimt modern art tapestry is backed with lining and tunnel for easy hanging.